Here’s the travel log for my trip to Orlando with the family, to attend a McDonald’s Convention and visit the theme parks. This was my first visit to Orlando and Walt Disney World in eleven years, and it was nice to get a break and see the new stuff, while also dipping into some nostalgia from my first visits to WDW in the early 1980s. Full travel log after the photo and jump. The cheapest way to get to Dulles Airport from Downtown DC is the 5A Metrobus; you just need to leave really early because it’s about an hour’s trip with traffic. I help a large woman having trouble with her large bag get to the back of the bus. It’s her birthday today, and she’s glad someone’s being nice to her. I’m flying AirTran. At the airport, I get through check-in and security with more than an hour to spare before departure, so I spend most of the time walking around Dulles Terminal B looking for food. I settle on Matsutake Sushi, which, ironically, has no sushi at the moment. I get a salad with sesame ginger dressing on it, which I finish just as my seat on the plane is ready to board. The plane is a Boeing 717-200, and my seat is a window seat. Along the way, I get a few photos of Dulles Airport, Daytona Beach, Orlando from above, and crepuscular rays shining through the clouds. Central Florida is very flat and expansive, with lots of lakes, open spaces, and suburban single-family homes. On arrival at Orlando International Airport, I must wait about fifteen minutes for a Mears shuttle. The airport ground transportation lobby has nice compact cushioned wicker chairs to sit in. When the shuttle van is ready, I ride shotgun, and am the first passenger delivered to my hotel, the Caribe Royale. The one-bedroom suites at Caribe Royale are rather small for a family of six. Since my dad is a McDonald’s owner-operator, most of the day is spent at the huge McDonald’s World Convention at OCCC. Thousands of owner-operators and food industry contractors are in the huge convention space, displaying new food items and restaurant technologies. We sample a “Le 280” burger (1/3 lb beef on ciabatta with bearnaise sauce), get free drinks, and watch business execs in corporate AVPs on big screens. The AVPs bring back unpleasant memories of my video editing days. That night, Universal Studios Orlando has been reserved and closed off exclusively for the McDo Convention delegates. The delegates with their families are still a lot of people, so it’s very much like a normal weekend at the park. We check out the Terminator 2 3-D show and the E.T. ride, both remarkably dated attractions, though I am quite impressed with the fog machine explosion effect at the end of the Terminator show. Note: You cannot make the E.T. ride say nasty things. There’s a preset list of names which the ride attendant chooses from, so a name like “Gago” does not pass muster. (Also, sit on the left side of the ride; on the right all you get to see is the emergency catwalks.) We watch the Horror Make-up Show, an uproariously funny live comedy show on horror movie effects. Lots of blood, and a monster behind a curtain. The Jaws ride is last, which was pretty much a cross between the Jaws part of the Universal Hollywood tram ride, and Disneyland’s Jungle Cruise — with sharks. Sadly, the park closes before we get to try some of the newer, more exciting attractions: MIB, Earthquake, Twister, and Revenge of the Mummy. Fine with me, really; I’m not all that big a movie fan. One of the funnest things about Animal Kingdom is right at the start: Wes Palm, a talking baby palm tree in a rolling planter who mingles with the crowd in line at the park entrance, talking with kids and adults alike with high-pitched botanical wit. There is only time for four attractions at Animal Kingdom: Kilimanjaro Safari, Expedition Everest, Kali River Rapids, and the Maharajah Jungle Trek. The Safari ride goes through a huge, perfectly replicated African Savannah, with lions and hippos and elephants and gazelles. It ends with a somewhat contrived chase after fictional poachers, ending with an animatronic scene of animatronic African law enforcers saving an animatronic baby elephant; rather anticlimactic after seeing actual elephants just minutes before. As for Expedition Everest, from the queue narrative to the ride itself, it is pure art. Relatively mild as a roller coaster, the thrill comes more from the torn-up tracks, the unexpected track changes, the dark backward rolls, and the final climactic vision of the giant Yeti swiping at you. Thoroughly enjoyable. On the Maharajah Jungle Trek, we see sleeping tigers and giant bats. Kali River Rapids gets us wet. At Epcot, we head for The Living Seas first, but most of the attraction is closed for renovation. “Turtle Talk with Crush” is open, however, and the long wait is worth seeing children marvelling at the interactivity they can enjoy with one of their favorite 3D cartoon characters. I will have to research how they do that. Next up is Mission: Space, the centrifuge-based space simulation I have been eagerly anticipating. It does not disappoint: the line is short, the briefing quick, the launch sequence produces only a mild sensation of spinning before the more realistic sensation of acceleration kicks in, and I get to be engineer, putting the crew into “hypersleep” and extending the landing wings. Much more fun than the simulation itself, however, is the console: every button and switch does something, making sounds and turning lights on and off. Such simple interactivity does much to add to the immersive experience. For some reason, Soarin’, a flight over California simulated by bobbing mesh seats before a large IMAX screen, seems to be immensely popular: the wait for it is almost an hour. I find it rather mild and unexciting, but I can see the appeal it has for a certain crowd — thrill-seeking grandmothers and their younger grandkids, perhaps. The citrus and pine scents help. We also ride The Land boat ride through the hydroponic farms, and the guide tells us there are hidden Mickeys all over the ride. Journey into Imagination has changed significantly since my last visit in 1995. Dreamfinder is gone, replaced by Eric Idle as Dr. Nigel Channing. I don’t find it quite as fun anymore, but the skunk gag was unexpected. Still, I want Dreamfinder back. 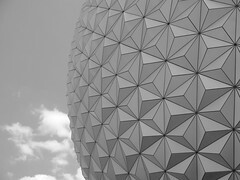 We end the day with Spaceship Earth. Oh, what a dated and insipid attraction, and yet still fun to ride, trying to figure out just where in the giant geodesic golf ball you are. We go to Blizzard Beach in the morning. Summit Plummet. SUMMIT. PLUMMET. I hit something like 55 mph, I think. The rest of the day is a blur of slides, splashes, and getting my arms tired swimming in the tide pool. Later in the day, after showering and dressing, we head to Downtown Disney, where we have dinner at Wolfgang Puck’s Fine Dining. I’m mostly unimpressed with the Wienerschnitzel Kartoffelsalat, but the crab cake is exquisite. Next time I will get the Florida grouper. After dinner, we wander around Disneyquest Interactive, playing an exhilarating Virtual Pirates of the Carribean cannon game, and wielding a lightsaber in “Ride the Comix.” Their stupid lightsabers need you to press down on two thumb-buttons the whole VR ride, which leaves me with aching thumbs the rest of the next day. The rest of the family still being Roman Catholic, they go to mass at the shrine of Mary, Queen of the Universe. (Yes, the universe.) The church is right beside Orlando Premium Outlets, where we spend the afternoon shopping before it is time to check out of the hotel and head for the airport. At the airport, on our way to the terminal and right after security, there is a shout. TSA personnel spread out and form a shield around the security barrier, and there are a few tense moments while people look around, wondering what is going on. Just as suddenly, an all-clear is sounded, a thumbs-up is given, and whoever triggered the security alert is allowed through. The flight home to DC with my brother is on Air Tran, with a connection in Atlanta. There are delays, and the airline loses our luggage. That is another story. See more photos in the Orlando 2006 photoset.